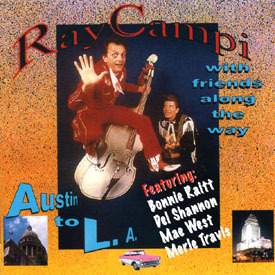 "with friends along the way"
On this CD, Texas Rockabilly ... Rebel and roots music legend Ray Campi shows us the very best of American roots music. Together with some of his music friends that he has been working with during the last thirty years, he delves into various styles as rockabilly, country, western swing, rhythm and blues, Texas waltzes, cowboy songs, ragtime, guitar instrumental, and the Spanish Two Step. And what an impressive line up of featured friends: Grammy winning artists Bonnie Raitt and Ian Whitcomb (also a music consultant for the film Titanic), world famous rock legend Del Shannon, classic film legend Mae West, country guitarist Merle Travis, the queens of country music, Rose Maddox and Rosie Flores, country and rockabilly music artist. Orville Nash, Rollin' Rock Record's artists Rip Masters, Johnny Legend, Tony Conn, Ronnie Mack and Kevin Fennell, Texas female vocalists Lou Ann Barton, Chris O'Connell, and Vivian Worden are included. Also included are the Los Angeles rocker Pep Torres, the powerful Los Angeles pianist Bobby Mizzell, the Cailifornia rockabilly Count Smokula and Texas musicians Harvey Campi and Harold Layman. This CD is not just The Very Best of Ray Campi's productions to this day, but I also rate this CD in the Top Ten of the Best American Roots Music CDs ever made. This CD should be included in the record collection of every person in the world.